I want every Australian unwilling to pay more for polluting energy sources to look the Tuvaluans in the eye and say "We're not doing anything about climate change because it's going to cost us too much". 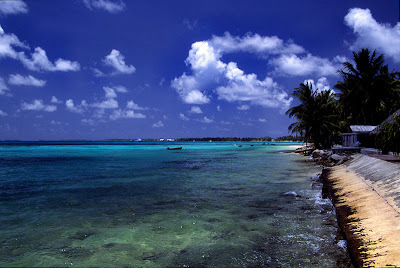 For those that haven't heard of it, Tuvalu is a small Polynesian island nation in the Pacific Ocean. At it's highest point, the island sits at 4.5 metres above sea level (average 2 metres). The island is highly susceptible to being flooded by rising sea levels and the rising saltwater table could destroy the ability to grow crops on the island. Fish stocks have also decreased. If trends continue as they are, the island may be inhabitable in 100 years. With their incessant whinging and complaining, Australian's don't know how good they've got it. The poor 'Aussie battler' is a myth. Travel to any areas of the world that are not considered first world countries and compare the standard of living to your cushy life here. The Tuvaluans could lose their entire country to the ocean due to climate change and they are literally one of the lowest emitters of carbon dioxide in the world. Australian's could lose a few hundred dollars a year on higher bills and miss out on buying that flat screen TV straight away. Who do you feel most sorry for? The Tuvaluan government (as small as they are) are putting in place an adaptation plan to help ward off the effects of rising sea levels as much as they can. Trialling salt-resistent crops, building sea walls on the shore and aiming for all energy to come from renewables by 2020. Unfortunately, the West aren't too eager to change. The argument is that Australia isn't a big polluter, but we do make billions of dollars every year exporting coal to be burnt in foreign countries. Can we really not take any responsibility, however convenient it is? Sadly the only way to help the transition is to use the only language we seem to understand - money. Make it cost more to use energy that contributes most to climate change. Use the money raised to develop cleaner technologies and we may maintain our export potential in delivering energy solutions to the world once all the coal is gone. Imagine the thought of losing our beautiful country to the effects of climate change. All of our history, culture and sense of home. Everything. If not for the polar bears, frogs and other climate-sensitive creatures, think of our brothers and sisters in Tuvalu. ABC's Hungry Beast covered the Tuvaluan story recently. Watch it here. Afterthought - the government could also use the millions of dollars wasted on the school chaplaincy program on developing renewable energy solutions (or ANYTHING else), but that's another topic altogether.